Crop rotation simply means that you will not grow the same crop in the same place from season to season. It is an important cultural technique that preserves soil fertility and helps control harmful soil borne pests and diseases. Crop rotation has been practiced for centuries. It can be traced to ancient Roman, African, and Asian cultures. It was practiced at all levels of farming – by individual subsistence farmers, market farmers, and those who farmed in collectives. It didn’t happen by accident. These ancient farmers observed that productivity and crop quality declined when the same crop was grown on a plot of land season after season. They developed a variety of rotation schemes. There were two, three, and four season rotation plans. Some included a season where the land lay fallow. The advent of mono-cropping in the middle 19th century changed traditional crop raising and the culture that was built around it. Hundreds of acres were planted in the same crop year after year and the land began to suffer for it. There is an old farmer’s adage that says “tomatoes follow corn”, but it’s much more than an old wives tale. In this example, growing corn in a patch of ground starves out the root knot nematode that attacks the roots of tomato plants. If you have observed an issue with root knot nematodes as you pull up your spent tomatoes, you can use this knowledge to address the issue by planting corn, or a related cereal grass such as annual rye, to starve them out naturally. If you grew the same crop in the same row or space season after season, the soil borne pests and diseases that affect that crop would build up in the soil. Pests and pathogens are opportunistic. You would be providing them the perfect opportunity to take up permanent residence. Moving the crop to a different row or space breaks the pest and disease cycle. Of course, tomatoes and corn are both heavy feeders, so there is more than just one factor to consider for rotating crops. It is usually preferable to have a light feeder follow a heavy feeder. This reduces the demand for essential nutrients and gives the soil a chance to rest and recover. Planting heavy feeders one after the other in the same place depletes the soil. This results in having to rely more heavily on supplemental fertilizers, especially nitrogen. The more you know about crop rotation, the better your garden will be. You will be able to manage some problems naturally, without adding chemicals, and you will be able to build soil as you garden instead of depleting it in the process. Is Companion Planting the same thing? No. Companion planting is another cultural technique for improving crops. It uses some of the same factors, such as plant or soil chemistry, but it is not the same as crop rotation. The terms are not interchangeable. 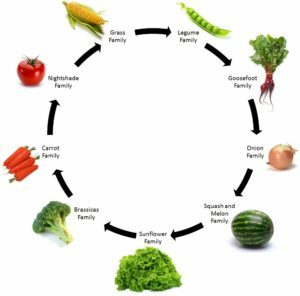 How can I use crop rotation in my own garden? First, you have to know the rotation families. 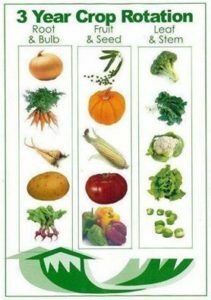 Most vegetables are grouped into families that have similar nutritional needs. They often share a susceptibility to certain pathogens and pests. There are always exceptions to this, but this general knowledge is a good place to start. Next, you need to know the rotation sequence. In reality, you could have a pretty good garden by just making sure you followed some sort of rotation that resulted in the same vegetable not growing in the same row or plot more than once in every fourth planting. But there are specific sequences that will make your garden even better. In most crop rotation strategies, crops are grown in specific successions. The successions can be subsequent years or subsequent seasons within a year, depending on your climate and the crops you are growing. In other words, a long season crop in a short season zone may mean that you can only grow one crop in a row or plot each year. But if you are growing a short season crop in a long season zone, you may be able to get two or three successions within one year. No! In fact it is very easy. Start with a simple rotation until it becomes second nature, then tweak your sequence in whatever way suits your gardening style and the vegetables you like to grow. Of course, you can make it as complicated as you wish. I do know gardeners that have taken it to extremes, but they seem to enjoy that part of it – we should all garden in a way that makes us happy. Just study your options and decide what works for you. Crop rotation can actually make your garden planning easier. It works beautifully whether you garden in rows or blocks, and it is SUPER simple for Square Foot Gardeners. How do I choose a rotation plan? Some rotation plans you will find are obviously designed for parts of the country with a short growing season. They assume that the entire garden will be planted at one time, harvested, and then allowed to rest for the winter. Gulf Coast gardeners will grow year round, so we need a rotation plan that allows for rotation as we replace crops throughout the year. One of my favorites is the 4-Step Crop Rotation. It is a very simple scheme to follow and it works very well. Absolutely! Biological gardening prefers cultural controls over chemical controls, and crop rotation is one of the top five cultural controls you can practice.